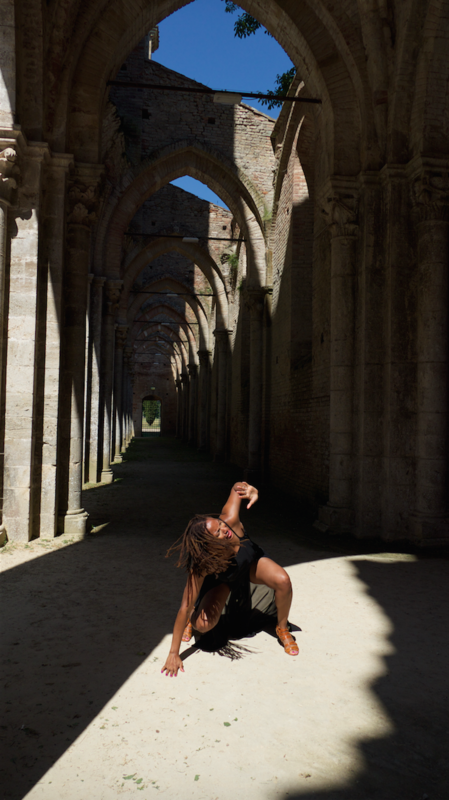 This is a bit of a sound collage (a bit that ended up on the cutting room floor) I made in response to artist and cultural worker Shani Jamila’s series of collages which were installed at the Manifesta12 Biennial this past summer in Palermo, Italy. 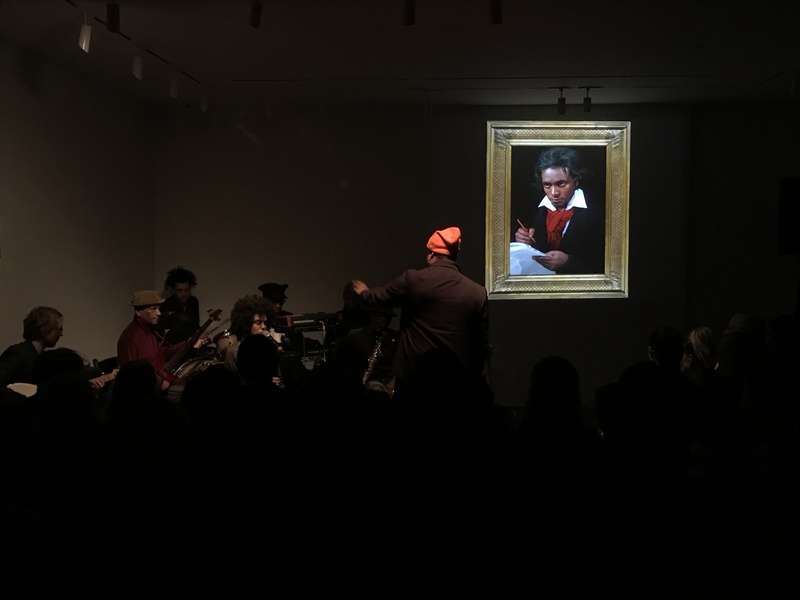 To celebrate the exhibition, Terry Adkins – The Smooth, The Cut, and The Assembled at Levy Gorvy Gallery last February, Greg Tate, with the Burnt Sugar Arkestra Chamber conducted a live score to Adkins’ video work Synapse — A Faustian portrait of Beethoven glacially transforming into a young black man and back, pondering the rumors of Beethoven’s Moorish ancestry, as well as his triumph over deafness. Terry Adkins created performances he called Recitals as part of his installations and exhibitions, after they had been open for a time and he felt they needed to be “activated”. At Performa in 2013 Adkins dedicated his Sacred Order of the Twilight Brotherhood Recital to his friend, the composer Butch Morris, who had just died of cancer, sadly about a year before Adkins would also succumb to the disease. Butch Morris was the type of iconoclastic, under-recognized figure that Adkins might’ve explored in his work. He invented a ground breaking form of improvisation called Conduction, using a highly refined language of gestures to shape the music of an improvising ensemble in performance. Acclaimed musician, writer and cultural critic Greg Tate became friends with both Adkins and Morris as a teenager in Washington D.C. in the 1980’s. Calling Morris his “sensei” Tate was inspired to study and begin practicing Conduction, forming the Burnt Sugar Arkestra Chamber in the late 1990’s. Their prismatic, organic integration of avant-garde jazz, electric funk, rock and contemporary composition was beautifully adapted for a live score to Adkins’ droning Synapse video, and to celebrate the lives and achievements of both Morris and Adkins. 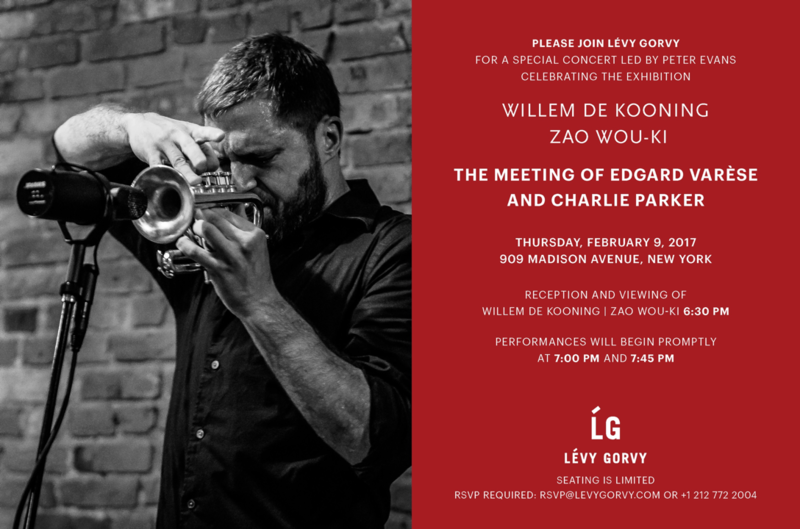 In celebration of Lévy Gorvy’s inaugural exhibition, Willem De Kooning – Zao Wou-Ki, I’ve curated a concert exploring the historic and unlikely meeting of French avant-garde composer Edgard Varèse and revolutionary jazz saxophonist Charlie Parker. To realize a program that juxtaposes the disparate music of these two 20th-century masters, trumpeter Peter Evans, uniquely qualified as an acclaimed jazz improviser and a virtuosic classical performer, has assembled a brilliantly versatile ensemble just for this occasion, including: Warren Smith – percussion, David Taylor – bass trombone, Jon Irabagon – saxophones, Levy Lorenzo – percussion/electronics, Alice Teyssier – flute. The Chinese painter Zao Wou-Ki moved to Paris in 1947 with his wife Lan Lan, a composer; amidst the artistic circles there he befriended Edgard Varèse, the inconoclastic composer of dense works of dissonance, noise and visceral new electronic sounds. In 1964 Zao dedicated a monumental painting to his friend. Dutch born painter Willem De Kooning often claimed his love of jazz as an inspiration for coming to America, once saying, “‪[Miles Davis] doesn’t play the notes, he bends them. I bend the paint.” With a technical facility that was both effortless and explosive, Davis’ mentor, Charlie Parker, would also influence every generation of jazz musicians to follow with the serpentine rhythmic swing and visionary harmonic flights that would become known as bebop. Shortly before his death in 1954, Parker sought out Varèse to study orchestral music with him, while they were both living in Greenwich Village. Varèse said of Parker, “He was like a child, with the shrewdness of a child. 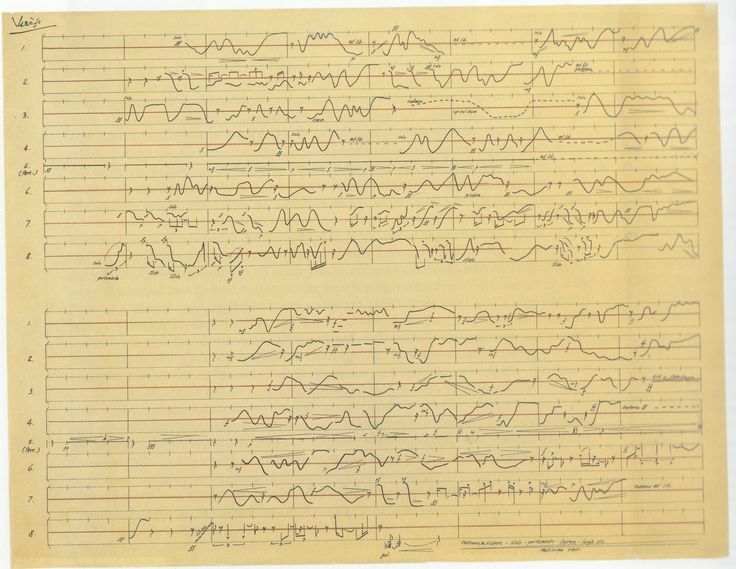 He possessed a tremendous enthusiasm.” The two never met again, but the encounter would resonate with Varèse as well and in 1957 he composed a graphic score for improvisation and recruited some of the top jazz musicians of the day to perform it. I’m thrilled that Ergo – As subtle as tomorrow was included on the New York City Jazz record‘s Best Albums of 2016 in their January issue. Thanks to the many people that worked on it and everyone who gave it their time and ears. Upwards and onwards! 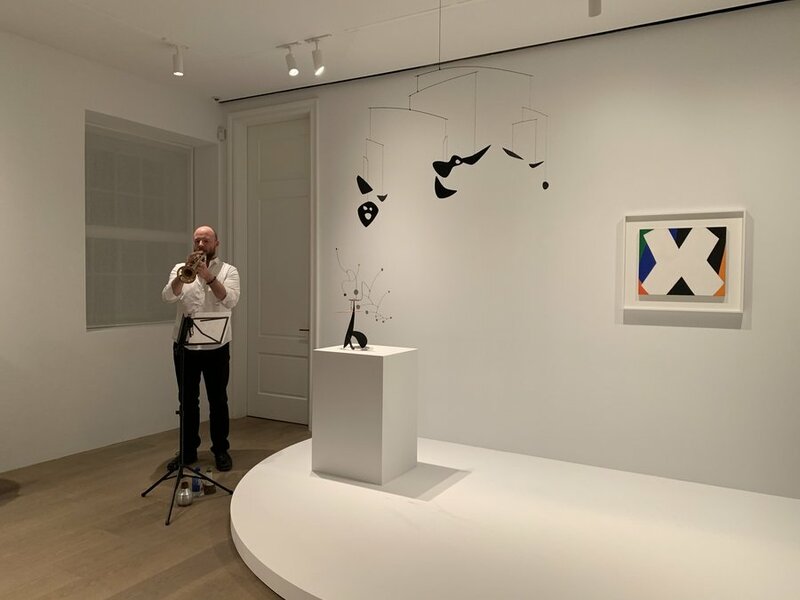 I’ve recently taken on the role of Cultural Programming Curator at Dominique Lévy Gallery where I’ve been programming performances for the last year or so. 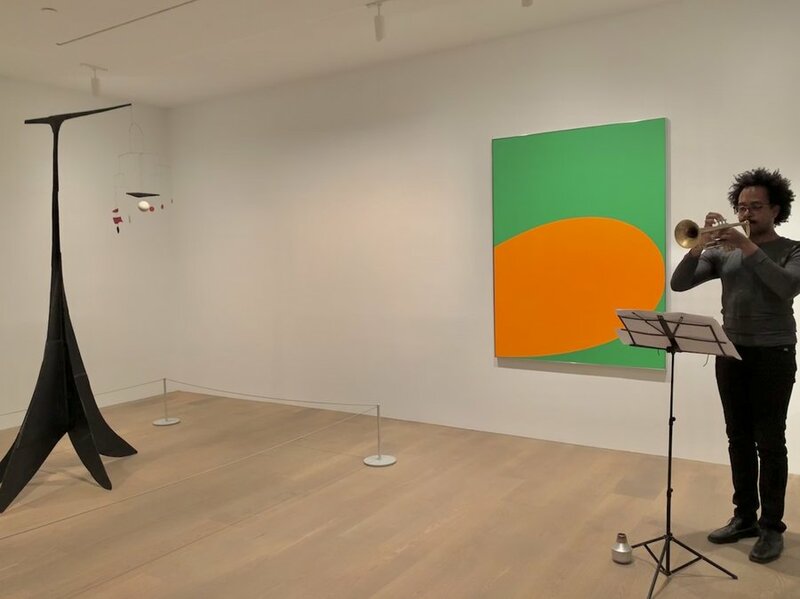 This Thursday the wonderful new percussion ensemble Sandbox Percussion will perform in celebration of our current exhibit of the sculptor Joel Shapiro. To sonically consider the playful weightlessness and the deceptive simplicity of Shapiro’s materials, forms and suspended installations, Sandbox Percussion will perform a program of Akiho, Cage, Crowell and Reich on December 8th. Lauded by The Washington Post as “revitalizing the world of contemporary music” with “jaw dropping virtuosity,” Sandbox Percussion has established themselves as a leading proponent in this generation of contemporary percussion chamber music. Sandbox made their New York debut in 2012 and in their fourth season last year gave a staggering twelve world premieres by new music composers at venue’s including the Norfolk Chamber Music Festival, the Yale New Music Workshop, Peabody Conservatory, Curtis Institute, Cornell University, and Brooklyn’s National Sawdust. 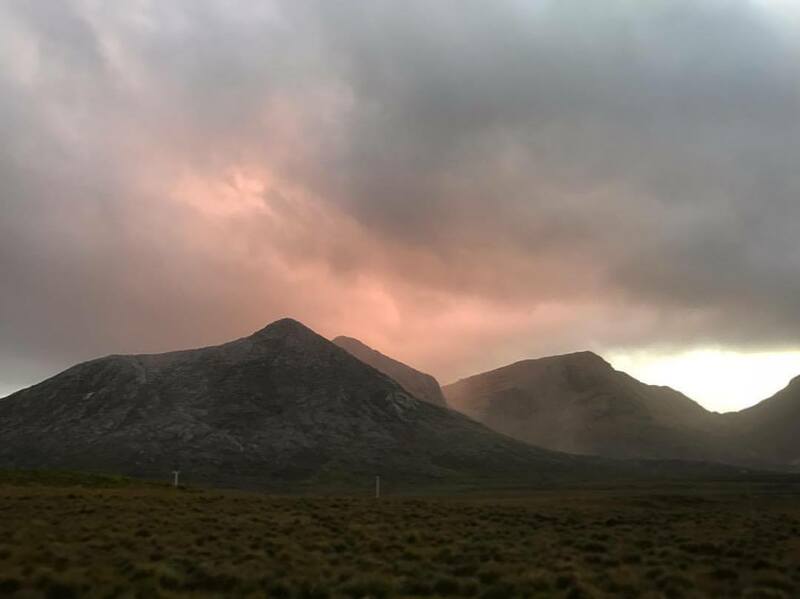 Through compelling collaborations with composers and performers, Jonathan Allen, Victor Caccese, Ian Rosenbaum and Terry Sweeney seek to engage a wider audience for classical music.